Every household should have a copy. Interested in philosophy? Try this. Interested in metaphor? Try this. Interested in law? Try this. Interested in chess? Try this, and also this, or visit the online version here. Welcome to the webpage for Classical English Rhetoric. Classical English Rhetoric is a book about the art of good writing. Its particular subject is the use of rhetorical figures: patterns for the arrangement of words that make them more attractive, compelling, and memorable. The patterns were first studied and named in Ancient Greece and Rome, and have since been put to use by the all the most effective writers and orators in English. Classical English Rhetoric explains the most useful of the devices and illustrates their effects with hundreds of examples from Lincoln, Churchill, Burke, and other masters of rhetoric. The book is available from amazon.com here. It’s now also available here as a Blackstone audiobook. Click here to read about the sequel. Not only educational but delightful. —David Mamet. I must refrain from shouting what a brilliant work this is (praeteritio). Farnsworth has written the book as he ought to have written it—and as only he could have written it (symploce). Buy it and read it—buy it and read it (epimone). — Bryan A. Garner, President, LawProse, Inc., and author of The Elements of Legal Style. So, dear reader, I say it even if I say it myself—get this book! No, really, get this book! Read clever Farnsworth, and read him again, and you may become more clever yourself. —Carlin Romano, The Chronicle of Higher Education. 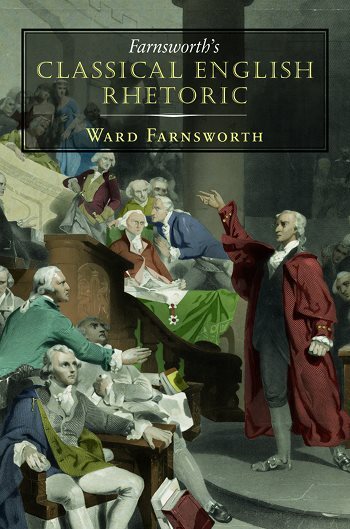 Should you buy “Farnsworth’s Classical English Rhetoric”? If you’re at all interested in the techniques of writing, yes. —Michael Dirda, The Washington Post. Deserves a place on the shelf next to the dictionary and thesaurus. Summing up: Essential. All readers. —ALA Choice magazine. Wonderfully readable. . . lively and inspiring. —Roger Ebert. Time was, rhetoric was considered a serious academic subject and an indispensable servant of virtue. Many things, from dictators to advertising, have made modern people suspicious of and cynical about language mobilized to move us. Fortunately, Ward Farnsworth’s delightful swim in a sea of well-chosen words should help to rehabilitate the reputation of rhetoric. —George F. Will, syndicated columnist and author of Men at Work: The Craft of Baseball. The most immediate pleasure of this book is that it heightens one’s appreciation of the craft of great writers and speakers. . . . But more than anything Mr. Farnsworth wants to restore the reputation of rhetorical artistry per se, and the result is a handsome work of reference. —Henry Hitchings, The Wall Street Journal. This book is great. . . . I recommend it strongly. —William Bennett, syndicated radio host and author of The Book of Virtues. Perhaps the reason for the present poverty in both oral and written expression is in part our severance from the past—especially our classical past, when pride in the written and spoken word was synonymous with character and citizenship. Ward Farnsworth’s invaluable review of classical English rhetoric is not only a vital tool for aiding clear expression, but a timely reminder that, despite the confusion of the present technological age, human nature, and our ability to communicate in clear and often beautiful ways, are unchanging. —Victor Davis Hanson, syndicated columnist and co-author of Who Killed Homer? : The Demise of Classical Education and the Recovery of Greek Wisdom. I knew instantly that this is a book to be treasured. —Hugh Hewitt, Professor of Law, Chapman University, and nationally syndicated radio host. Mandatory for persons involved in public speaking, this book should prove indispensable also to writers wishing to improve their literary style. —John Simon, author of Paradigms Lost. What might have been (and in many texts on rhetoric is) a dry analysis full of rebarbative Greco-Latin terminology (epizeuxis!) becomes an enchanted garden of lively English prose. . . I admire it; I appreciate it; I recommend it. —Stephen Dodson’s review at www.themillions.com. The best introduction to rhetorical figures which has yet appeared. An essential reference for anyone who studies verbal style. —Richard A. Lanham, Prof. of English Emeritus, University of California at Los Angeles, and author of Revising Prose and A Handlist of Rhetorical Terms. Read his full review here. Ward Farnsworth’s sparkling compendium is a handbook of eloquence that will delight readers of a certain ilk (you know who you are). Anaphora, epistrophe, isocolon, chiasmus, asyndeton, praeteritio, litotes, and other ghosts of linguistic glory are explained and resurrected in the words of writers like Edmund Burke and Winston Churchill, Herman Melville and Charles Dickens, Chesterton and Conan Doyle. Priceless. —The Barnes & Noble Review. Farnsworth is on a scholarly rescue mission. . . For our colleges and universities, where things like rhetoric were once taken seriously, the assignment of Mr. Farnsworth’s book as required reading might just awaken some echoes of what used to be a primary mission. —John R. Coyne, Jr., The American Spectator. I admire this book and enjoy noting how these allegedly artificial tropes are actually what the tongue naturally seeks. —Peter Elbow, Prof. of English Emeritus, University of Massachusetts at Amherst, and author of Writing Without Teachers. Mr. Farnsworth, who despite being a professor of law writes clearly and trenchantly, wastes no time here with the trite and the trivial. This book of categories of figures of speech abounds with impressive examples: Abraham Lincoln, Pitt and Churchill addressing the House of Commons, Dickens gleefully exploiting combinations of language like Bach improvising at the organ, Shakespeare and the Authorized Version of the Bible establishing expressions for the centuries. —John McIntyre, The Baltimore Sun. [A] word-lover’s delight . . . Farnsworth omits the two most common forms of rhetoric, metaphor and simile, because they merit a treatment of their own. This reader hopes he will issue such a book. —Lori Kranz, The Bloomsbury Review. Makes rhetoric interesting again. . . will be a source of great enjoyment and fascinating learning for those who value the art of good writing. —Spell/Binder (newsletter of the Society for the Preservation of English Language and Literature). This is a book to treasure. . . Pick any page and it will be a fascinating read. —Porter Square Books. I think I’m in love. —Lisa Almeda Sumner at The Bibliophiliac blog. This book is great. . . . I recommend it strongly. —William Bennett, syndicated radio host and author of The Book of Virtues. I knew instantly that this is a book to be treasured. —Hugh Hewitt, Professor of Law, Chapman University, and nationally syndicated radio host. Interested in philosophy? Try this by the same author. Interested in metaphor? Try this by the same author. Interested in law? Try this by the same author. Interested in chess? Try this by the same author, and also this, or visit the online version here.